Super Savings Item! Free Shipping Included! Save 36% on the Sound Bar, Meidong Soundbar for TV 72 Watt 43-inch 12 Speakers 2.0 Channel Bluetooth Speakers Wired and Wireless Surround Stereo Audio for Flat Screen TV Computer (2018 Model) by meidong at IGWT. Hurry! Limited time offer. Offer valid only while supplies last. 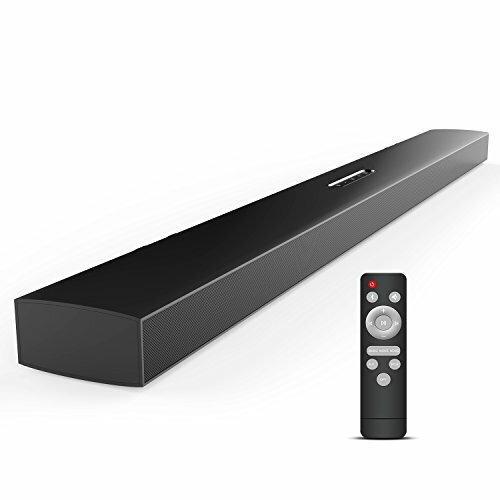 43-Inch Sound Bar:Featuring a 2.0 channel and a slim design, this 43-inch soundbar has very large size to better match 50 inch or larger TV with wireless remote control. The shell of the soundbar is made of solid, compact aluminum alloy.The clear sound that makes the room filling with home theater sound. 12 Speakers Better Audio:Meidong Sound Bar is made of 12 high quality speakers that can enhance volume and sound clarity. 8 bass boost radiators enhance quiet sound at lower volume. They aredesigned to deliver best audio quality with crystal clear sound. Multiple Options:Four different ways for connection: OPT cable, Bluetooth 4.1, RCA, 3.5mm audio interface. OPT cable is provided for you to connect the soundbar to TV for pure sound.They can connect to TV, audio and Bluetooth devices. Three kinds of sound modes：Music, News and Movie. Super Easy to Operate:The soundbar is easy to set up. Simple operation for the remote control. No hassles or fumbling with tiny parts. No complexed instructions.The sound bar brings pleasure and enjoyment connecting to different equipment. In The Box: One sound bar, one remote control, RCA line ,3.5mm audio cable, power adapter,user guide. Sound bars can be mounted on the wall, also can be placed on the coffee table or under the TV . But the standard accessories do not include a wall mount, if necessary, please purchase it separately.